So far the week has stuck to the 2015 theme of volatility. One day up, next day down and then first-up-&-then-down day – up & down moves compacted in a six-and-half hour session. Let’s assess this week’s market action so far. The week started with much anticipated change of guard in Greece from the EU establishment-backed politicians to so-called-down-trodden-backed politicians. Alexis Tsipras of Syriza took helms on Monday of a government that is itching to have confrontation with the Troika that has been keeping Greece afloat for sometime now. Still, the European market roared on Monday – German DAX was up +1.4%; U.K’s FTSE 100 was up +0.3%, French CACI 40 was up +0.7%, Spain’s IBEX was up 1.1% and Italy’s FTSE-MIB was up +1.2%. However, the enthusiasm did not extend with same intensity across the Atlantic or Pacific for that matter. The Asian markets had lackluster Monday and so were the North American markets. The U.S. indices opened lower but then gradually moved up and finally eked out a modestly up day. Dow Jones was up almost unchanged; S&P 500 and NASDAQ Composite were up +0.3% each; Dow Transportation Average was up by +0.6%; Russell 2000 outdid every one and was up +1.0%. 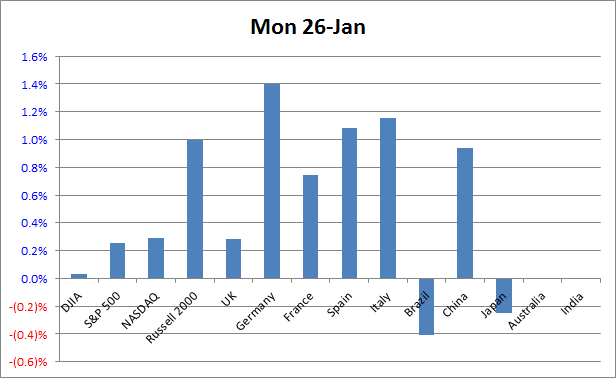 Monday did not have any market moving economic report either. The German Ifo Business Climate came in line at 106.7 compared to the forecast of 106.3 and 105.5 last month. It is a survey of 7000+ businesses and acts as a leading indicator of economic health. It’s sub-index, German Business Expectations disappointed at 102.0 versus the forecast of 102.5 but German Current Assessment was better at 111.7 versus forecast of 110.7. Dallas Fed Manufacturing Business Index disappointed at -4.4 when the expectations were 4.0. It is based upon Texas Manufacturing Outlook Survey and the is reflecting the current slowdown in state’s large energy sector. Tuesday rolled around with market moving economic activities. China’s CB Leading Index m/m was 1.1%, better than last month’s 0.9% and Australian NAB Business Confidence was 2. 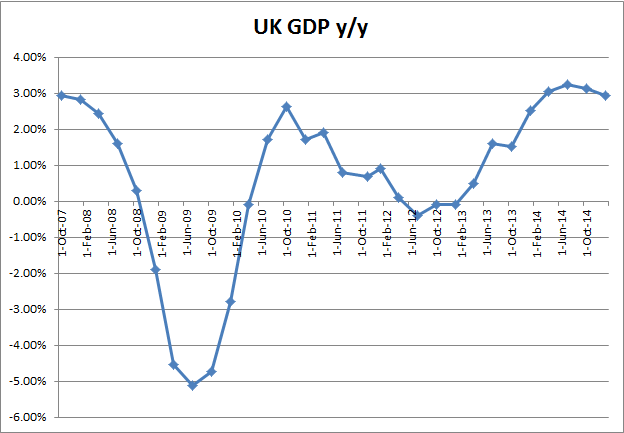 But, UK’s Preliminary GDP q/q disappointed at +0.5% versus forecast of +0.6%. Q4 growth was +2.7% from last year, market was expecting +2.8%. UK’s BBA Mortgage Approvals also disappointed at 35.7K versus 36.6K expected. BBA (British Banker’s Association) Mo0rtgage Approvals measures the number of new mortgages approved for the month. Fireworks continued on the States side with Durable Goods misfires. The Durable Goods Orders m/m had a major miss with actual reading of -3.4% versus expected +0.6%; the Core Durable Goods Orders (without volatile transportation items) was -0.8% when +0.6% was expected. This dose not bode well for reaching the 2% inflation target. 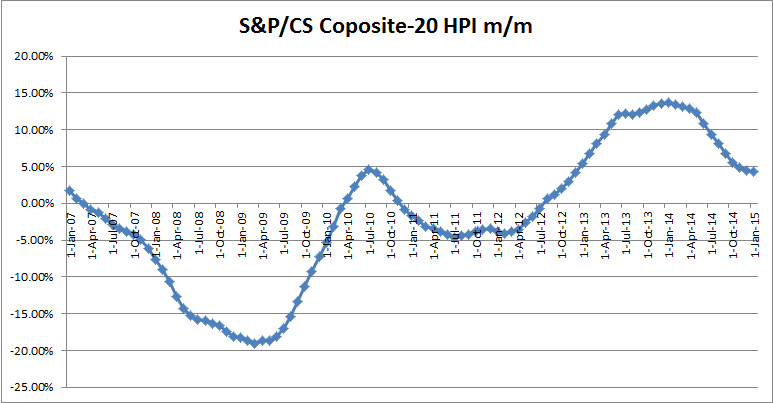 S&P/Case-Shiller Composite-20 HPI y/y came at 4.3%. This is the change in selling price of single-family homes in 20 metropolitan areas. 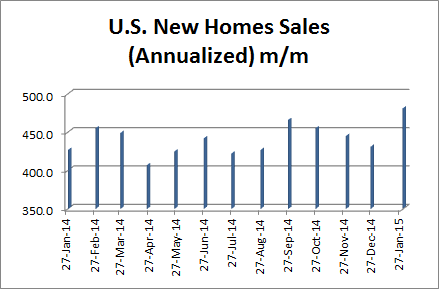 The New Home Sales at 481K beat the estimates of 452K annualized. Compared to Monday’s Dallas Fed, Richmond Fed’s Manufacturing Index came in line at 6. Conference Boards’ Consumer Confidence at 102.9 beat the forecast of 95.3, reinforcing the reading of University of Michigan’s Consumer Sentiment. 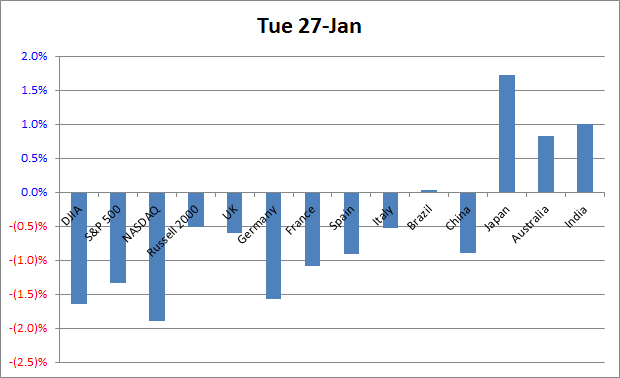 Tuesday also saw mixed Asian Markets. The up markets were Japan’s Nikkei +1.7%, South Korea +0.9%, India +1.0%, Australia + +0.8%, Indonesia +0.3% and Thailand +0.1%. The downers were Shanghai -0.9% and Hong Kong -0.4%. The European bourses had a sluggish start. 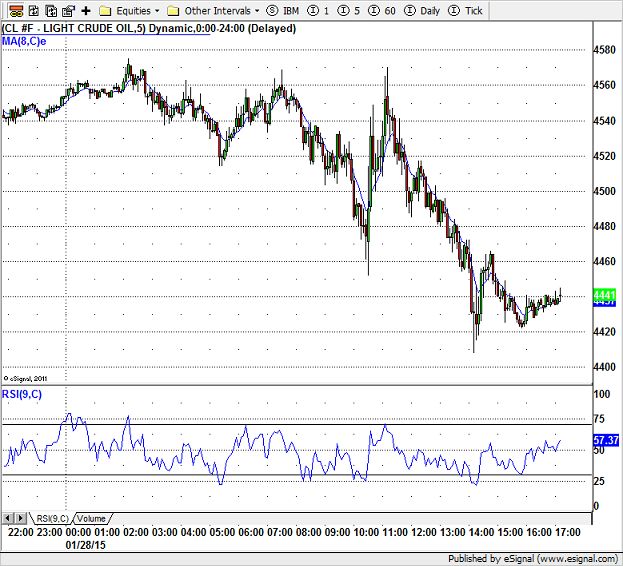 U.K’s FTSE was hurt by GDP miss and closed down by -0.6%. European markets also were down – German was down by -1.6%, France by -1.1%, Spain by -0.9% and Italy by -0.5%. U.S. morning was also rocked by the disappoint 2015 outlook given by Caterpillar, and its missing earnings estimates. 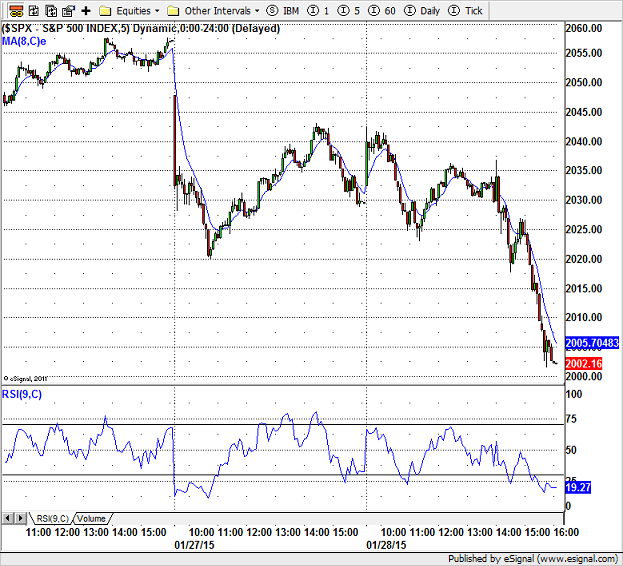 The economic reports did not help and the major indices fell out of the bed at the open. For the day Dow closed down by -1.6%, S&P 500 by -1.3%, NASDAQ by -1.9%, Transportations by -1.2% and Russell 2000 by -0.5%. The week’s second much anticipated day was Wednesday, the day of FOMC Statement day. And it did not disappoint, though it is a bit complicated to figure out what happened and the meaning of the Statement. The economic reports scheduled for the third day of the week were not earth moving. The German Import Price Index m/m and y/y, came below the forecast. Actual was -1.7% and -3.7% whereas the forecasts were -1.5% and -3.5% respectively. Prices are still deflating, this is the third negative reading in a row. Gfk German Consumer Climate, on the other hand, came at 9.3, which is above the forecast of 9.2 and last month’s 9.0. The real fireworks were again at the Stateside. First the EIA Crude Oil Inventories level was 8.9M versus the estimates of 4.2M. 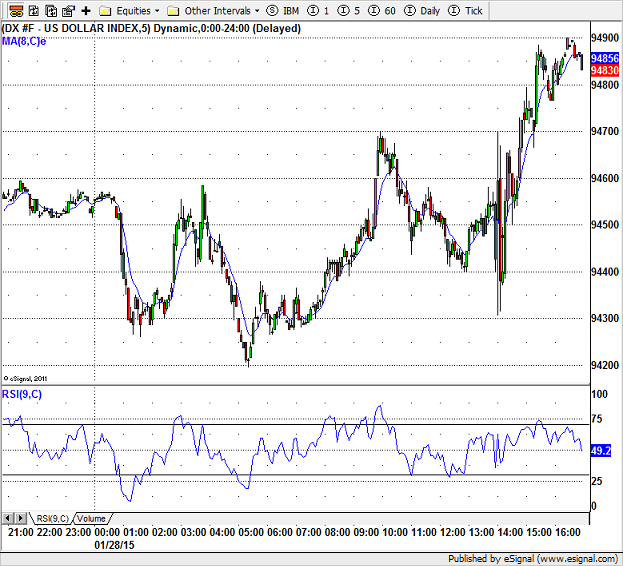 This collapsed the WTI Light Crude futures and they dropped to 44.53 by the 02:30 PM. The FOMC Statement had something for both the doves and the hawks and sharp gyrations of various markets confirmed that. Before the statement, the major U.S. indices were in the positive after the big drop of Tuesday. Immediately after the statement they rallied more but then declined sharply. It will probably take a-day-or-two for investors and traders to digest the statement. The FOMC Statement said that the economic activity is expanding at a ‘solid pace’ as compared to ‘moderate pace’ that it noted in December. Other change or impressions include ‘strong jobs gains’ in January as compared to ‘solid jobs gains’ in December. It also noted that decline in energy prices have boosted the household purchasing power. This change of wording gives the indication that Fed is feeling that economic improvement is increasing. January’s statement mentions that the inflation ‘declined further’ as compared ‘continued to run’ below the target. It also noted that market-based measures of inflation compensation have declined ‘somewhat further’ as compared to ‘substantially in recent months’. Fed also said that the labor market indicators ‘continue to move’ towards its objectives and that it sees the outlook for economic activity and labor markets as nearly balanced. It also anticipates the inflation to decline further in near term, something that it did not wrote in December. But, like in December, the Fed still expects the inflation to rise gradually toward 2 percent target. 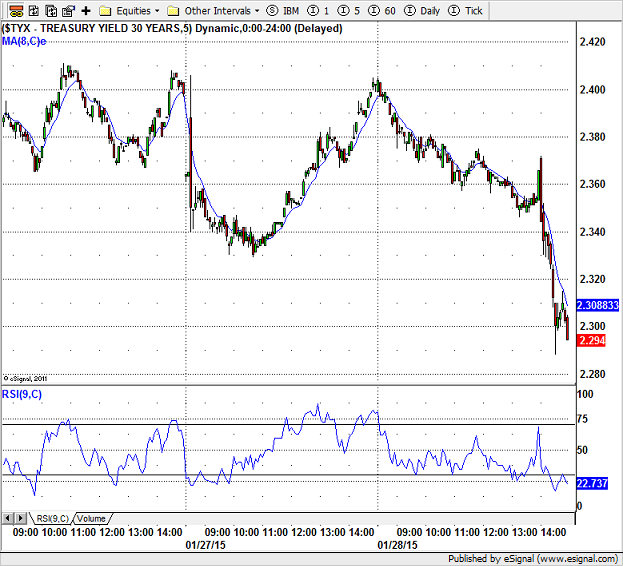 The sharp up moves in treasuries and dollar and down move in equities means that different group of investors are taking Fed’s statement as either dovish or hawkish. Fed sees the available economic data to be painting the best picture in years. As Tim Duy of Fed Watch says, Fed is not seeing any warning signs for inflation in the data and think that the low inflation is transitory. Fed has also indicated that it is keeping an eye on a number of indicators including international. It seems that Fed is giving the hint that it will stick with the signal that it gave regarding a rate hike in June. A number of market participants including the likes of Bill Gross believe so, there are many who believe that the rate hike will be later than that and we are in that camp.